The Henny Penny Employee Foundation (HPEF) recently awarded a $5,000 grant to the Girl Scouts of Western Ohio. EATON — The Henny Penny Employee Foundation (HPEF) recently awarded a $5,000 grant to the Girl Scouts of Western Ohio. This grant will allow the Girl Scouts to expand their activities in Preble County, enabling girls to participate in scouting activities regardless of the family’s financial situation. Pictured is Mel Hohler, HPEF Board chair, presenting the donation check to local girl scouts and their leadership. The HPEF receives funding from Henny Penny employees and the Board is comprised of employees from all areas of the company. Grants are awarded to non-profit organizations who offer programs and services in the areas in which their employees reside. 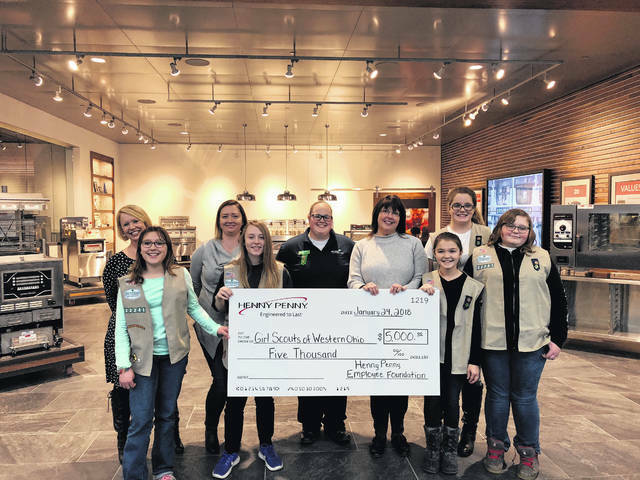 https://www.registerherald.com/wp-content/uploads/sites/41/2018/02/web1_IMG_2989.jpgThe Henny Penny Employee Foundation (HPEF) recently awarded a $5,000 grant to the Girl Scouts of Western Ohio.